My husband LOVES candy and sweets. A couple years ago, he severed his Achilles tendon playing soccer and needless to say, he was on crutches for a while. He hated it! I wanted to surprise him with a candy bar with a clever saying every day when he opened his briefcase just to cheer him up a little. We kept it up for over a month and I just wanted to re-post an updated list of Two Dozen Candy Sayings since Valentine’s Day is just around the corner. 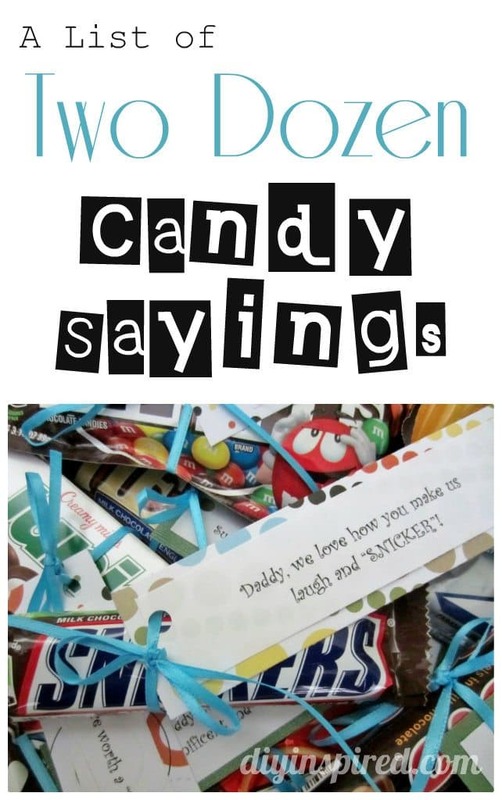 CHECK OUT THIS UPDATED LIST OF CANDY SAYINGS! Mini Chips Ahoy Cookies – For our own special ‘COOKIE’ monster! Butterfinger – We love you so much “BUTTERFINGERS” won’t count that high! Kit Kat – We don’t ever want a break from you! Snickers – We love how you make us laugh and “SNICKER”! Junior Mints – You are worth a “MINT”! Peanut M&M’s – We’re “NUTS” about you! M&M’s – You make us melt! Rice Krispies Treat – I think it’s a “TREAT” that you’re my Daddy! Peanut Butter M&M’s – Daddy, we think you’re Magnificent and Marvelous! Hazelnut Chocolate Bar – We love you so much it’s “NUTS”! Milky Way – We think you are out of this world! Anything with cookies – We love you so much it makes us COOKIE! Zero Bar – You’re not a “ZERO”. You’re our hero!! Heath – Sugar and Spice you’re everything nice! York Peppermint Pattie – Daddy, we get the sensation from you! Twix – Just be “TWIX” you and me, we love you! Rolos – Daddy, you’re my “ROLO” model! Slim Jim Twin Pack – Daddy, we hope no one gives you any “BEEF” today at work! Candy Dipped Fortune Cookies – We are so FORTUNE ate to have you in our lives! Anything with Nuts – There’s “nuttin” I wouldn’t do for you! Anything chewy – We CHEWS you! Bit O’ Honey – You’re as sweet as honey. Mini Nutter Butters – We love cookies “BUTTER” hearts are with you. Here are some sweets for my sweet. I recently did a post on Briefcase notes for Daddy. Who says you only have to do this on Valentine’s Day?